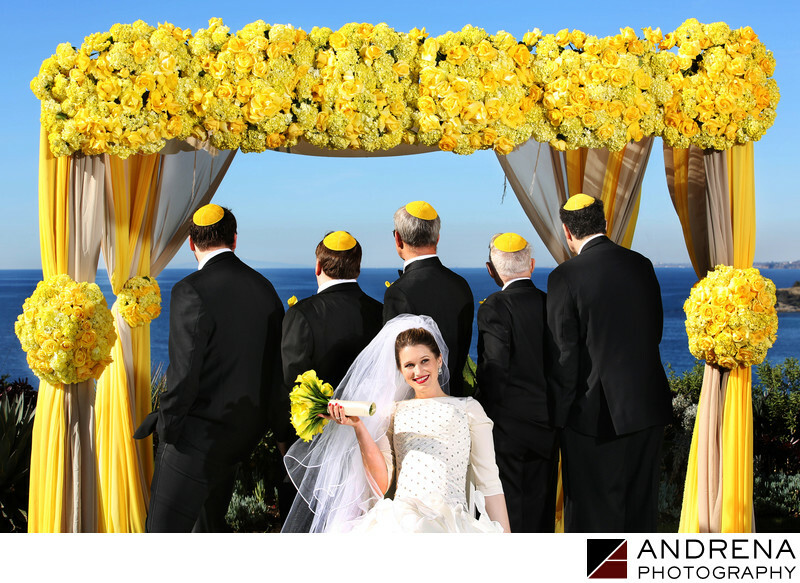 This adorable Orthodox Jewish bride was inspired by the color yellow. Her engagement ring included a yellow diamond. Her chuppah was dripping with gorgeous yellow flowers. Her reception flowers were yellow, as was her bouquet. And the custom guest yarmulkes were yellow as well. I loved the yellow yarmulkes so much, and thought it would be really fun to have some of her relatives stand under the chuppah, facing away from me so I could photograph the yarmulkes. But the sea of black just didn't seem right, so I pulled up a chair and asked the bride to sit in it. The resulting image is so fun and colorful, and is sure to be cherished by the bride and her new husband. This image was taken at the stunning Ritz-Carlton Laguna Niguel on a perfect winter day in December. It's a little known fact, but the summer months often bring fog to the beach. I find that the beach weather is often more clear during the winter months, which are also quite chilly. I love the way bright yellow looks against the blue of the ocean. Orthodox Jewish wedding photographed in Laguna Niguel, California.